Ah Min (Ronny) wrote a post that was quite touching for me. The great thing about him is his ability to pour out the deepest thoughts from his heart with such honesty. 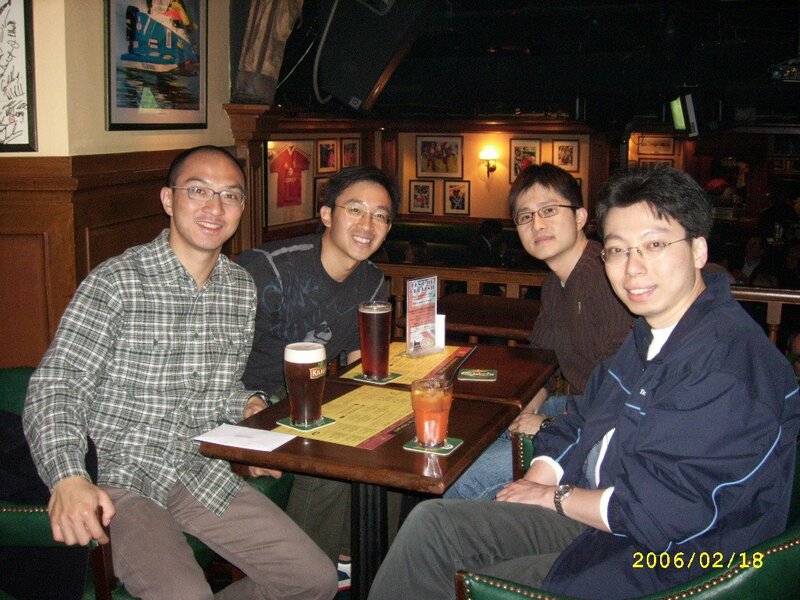 Last saturday, we met up with Ah Kwai who just returned from America. Ah Kwai (Timothy) wanted to be a good doctor, knowing that opportunities are few in Hong Kong, he went all the way to US last year to strive for his dream. On saturday night, we sat down in Dickens and had one of those long chat over beers. We always talk about plans and dreams. Ah Kwai said that it has been a fruitful decision for him to move to the US, being able to see the world's diversity was great for himself just as a person. We both shared our feeling of suffocation of Hong Kong, such a small place with such homogenous attitude to life. I don't want to get started here. But my dream to be in the development partitioner will one day come true. Okay in an effort to lay the marathon ghost to rest, I am contributing another piece to the blog world, just so to push the marathon post further down. Just finished another great audio book called 'Gun, Germs and Steel' by Jared Diamond. It is good if you are interested in anthropology, the study of human. The author offer an interesting theory on what it was the Eurasian civilisation, defined as every culture that live on the Europe Asia continental plane, that has rise above the other (American, African, Oceanic and Australian) civilisation in terms of economic and technological development. Why was it the Eurasian who set sail and conquered and colonised the world but not other culture. According to the author, the Eurasian's advantage is entirely environmental, there are two key factors, the larger size of the Eurasian plane and the East-West orientation of the continent. The larger land mass means more variety of species of plants and animal, which lead to domestication of crops and large mammals and the development of arigculture society. It is interesting to know that only 14 large mammal species were ever domesticated in mankind's history, and with exception llama by the Inca, all others were developed in Eurasia. So many African mammal just weren't the right candidate for domestication. The second factor is perhaps more important, Eurasian continent lies at East-West orientation, which means a vast land mass share the same latitude and climate. Hence a plant species once domesticated can be reproduce across the continent within similar climate zone. This lead to the migration of society, development of trade and diffusion of technology. The North-South orientation of America has hinder such development. Another interesting fact, the Aztec in Mexico had invented wheel independently in 3000BC, the llama was domesticated by the Inca at around the same time, but the two inventions have never met each other before the arrival of the European. My adventure race partner, Andy, just called and said that he has got some complimentary entry to the Bintan Triathlon for me. Haha, where is life leading me to? Now I am doing Triathlon as well!! I want to put more time on climbing but this is too good to resist, free entry to the event, free hotel, free meal and free Ferry connection to and from Singapore. We are just gonna try out the sprint distance (750m swim, 20km bike and 5km run), should be a walk in the park for me. Then I can probably stay on the do some windsurfing in Bintan. Next weekend, Ramon and Karen, my mates from the Nottingham days are getting married. The brother and sister team gathered for a meeting last night. It was kind of strange, we had to practise for hymn singing as there wouldn't be too many Christians in the church, so we had to be the 'choir' as well. The wedding will take place across NT, Kowloon and Hong Kong. We had to gathered in Tin Siu Wai in the moring, then stormed the bride's house in Tuen Mun, the church service will be in Central and the Banquet will be in TST. A new definition for 'Extreme Wedding', almost worth a google earth route. Sorry the hype is over, but I don't have much else to write about, here are some photos from marathon-photos.com that just came out. Notice how my left arm was fixed at the painful finish! As I approach the turning off point on Ting Kau Bridge, I hit the 21km right on 1hr50min, that was exactly my half marathon time last year. "Things have been looking good, I can get this done within four hours." But beyond 21km is uncharted territories for me, the longest I have done on road is 21km. It is the 2006 Hong Kong Marathon, I am running the first full marathon along with 5000 runners. I did a last minute filled in of a GROE team and so I set a target of 4 hours to finish it. The GROE runners get to start with other elite runners at the front, but I am not sure if that helps, being over taken by about 500 fast runners in the first few kilometers really disorientated me. Though as I calmed down and start timing my speed, I realised I am doing 5min/km, not a bad speed for myself. I manage to keep this pace for the first half of the course, beyond that I has no idea how my body would withstand. At around 25km, energy began to leak out of me and I my speed plunged. It was when I hit the low of 9min/km, I decided to drive harder. Every now and again, I would locked on someone who just overtook me and tried to win back to lead, they would eventually shake me off but I played this game for very much the next 10km to keep up the spirit. Toward the X-Harbour Tunnel, many runner began to have bad cramps and at least I was still running, even if merely jogging. Only 5km beyond the tunnel, a blind runner and his guide ran pass me, the guide was constantly talking to the blind runner, encouraging him to shoot for a under 4 hrs finish. That was the final push for me, I just kept up with the pair for the final distance. At the final 1km mark, my left back began to have a cramp, so I have to lock my left arm and swung harder with my right arm to keep the momentum. No time to slow down, only 6 mins left to 4 hrs. Every sense of awareness was directed toward my tired legs, keep running! you can have the cramp of your life beyond the finishing line, but for now take me home! Finally my foot hit the finishing line, the sweet beeping sound caused by the champion chip detector greeted me. It was 3hr59min45sec a hell of a run. The climax of the running season is nigh, this sunday I will running my first ever marathon in the HK Marathon. The original plan would be turn up with insufficient training and stuggle through, just enough to avoid the humiliation of being pick up by the minibus. But motivation always come unexpectedly, I was asked to be a last minute replacement for a GROE team. A GROE team is a team of four people which runs a leg each of the 4 marathons sponsored by StanChart. The guy who meant to do the HK leg got sick and I was asked to take his place instead. So I am in the SCB All Star Blue team which will be racing against the SCB All Star Green Team. Well I know it is just loads of corporate mumble jumble, but at least I got something to run for. Also being a GROE runner, I get to start in the front with other elite runners, and I get to pick up my own water bottle on routes after filling them up with what ever I like, how about a bottle of dry martini at the last water point, haha. So final preparation tomorrow, I am gonna get a nice massage!! 4:26:44 is the time it took me to finish the King of The Hill - Hong Kong Island Race. And this is my personal best finishing time for a KOTH full marathon. I have actually managed to cut my last year's personal record (5hr20m) by almost an hour! The KOTH - Hong Kong race started off at Repulse Bay and ran a 30km grilling circle back to where it start, taking the runner as far as Quarry Bay, Mount Bulter, the Twins above Stanly. The weather was perfect, dry and cool. I turned up with a week of intensive running and biking trainning but it didn't occur to me that I was going to improve by an hour then. Things began to look nice when I found myself catching up with the tail of the half marathon runner (who started 15 min early) before the one hour mark. It has taken me much longer to do that last year. Then on the flat trail run above Quarry Bay, I found myself literally spinning though. Last year I had some imbecile grannies insulting me on that session that I was running too slowly. And so forth with every difficult session, it felt next to nothing and I was actually slowly pulling away from runners behind me. Finally onto the last test, at the Twins above Stanley, where I had a cramp on the 1000 steps staircase last year, I was holding my speed, edging so slowly toward the two runners in red shirt but in vane. Then I saw this white figure speeding toward me while I got to the top of the stairs, so I started charging down to Stanley. The white figure picked up speed and I had to keep raising my tempo. We were already 4 hrs into the race and part of me said I should slow down a bit as position meant little, but then part of me said I should give him a good fight and aim for a 4.5hrs finish. The latter part won, and I was charging down the final 3.2 km of catchwater footpath like I am doing interval training in the park. The guy behind me showed no desire of overtaking me, then I realised that he was using me as a motivation as much as I was using him to drive for better result. So I ran even faster like I got his expectation on my shoulder. We overtook the two red runners that I saw on the way up the Twins and one more runner who overtook me in the first hour and had kept his lead since. It was an electrifying finish as we spinned down the beach for my personal best, thanking each other for a good fight. To download the google earth placemark for the race route, click here. Congradulation also to Andy, my temp spark partner, who finish the half marathon in 2:30:04. Just updated the google earth placemark with more details, you can play a virtual tour of the race. Took 3 days off this week so I don't have to go to work for the whole week with the rest made up by the Chinese New Year Holiday. The CNY holiday has been bad for Gabs the Climber, as the climbing community took the wrong ferry for Tung Lung Island and found themselves in Krabi instead. A few others even got as far off course as ending up in Beijing, poor souls, they have to keep ice climbing all week to keep themselves warm. Despite the lack of climbing, the CNY holiday have been quite a revelation for Gabs the Adventure Racer. I used to keep saying that there are lack of trail running possibilty from the proximity of where I lived. I ended up taking a bus to Hong Kong island where the trail network is more complex. Only because I never bother to try. Well here is what I, Gabs the Runner, found out on Monday that I can quite possibly leave home (To Kwa Wan) and run to the Wong Tai Sin in about 15 mins from there I can ran up the insanely steep Shatin Pass Road. Uphill all the way pass the store that sells tofu custard. I kept running up hill till I got to the top of Kowloon Peak (Fei Ngo Shan) then a gentle downhill passing some out of breath hikers takes me back to urban pollution. A nice run that last about 2.5 hrs. 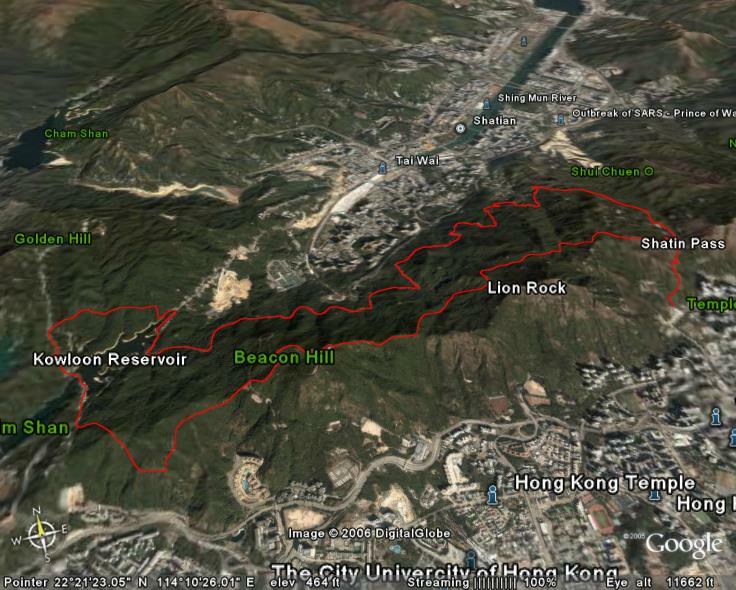 Today I did series number 2 of the run, when I got to the store at Shatin Pass, I turn left to run the McLehose Trail till I got to the Kowloon Reservoir, then I ran round the reservoir and headed back to the Shatin Pass via Wilson Trail. A nice circuit of 4hrs. (The above google map picture shows the fill trail, you can download the placemark here). Now that should be nice training for Marathon. Yes I am doing the full 42 km for the first time this year. Need to get it out of the way so I can stick my finger up at people I hate but do boast about their marathon experience. Of course finding a new trainning route that consist of McLehose and Wilson Trail can hardly be called a revelation, the real revelation was that a 3 hrs massage in Shenzhen (for $100 only) really boost my running. Yesterday, I headed north to Shenzhen for a massage and today my feet weights nothing! Now that revelation alone should equip me for the coming marathon. CNY has also been great for Gabs the Connoisseur, I didn't go all the way up to SZ just for a cheap massage, it was for the lamb feast! 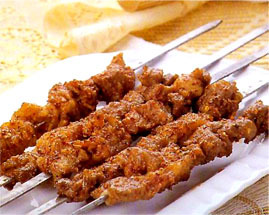 There is this lamb specialist restaurant called 'Muslim' (穆斯林) that sepecialise in lamb, even for lamb kebab, they have 8-9 variety, and I am not talking about you can have it on a tooth pick (yeah, so you can pick your teeth right away), on bamboo stick or in big iron stick. I suppose they all taste difference as I only had the tooth pick kebab. Then there is alo Hand Grab Lamb (手抓羊) and Lamb Spring Roll. Shame it was a lunch, so we didn't get to eat the BBQ Whole Lamb. Suddenly I realised I have just been writing like Ah Min, except joining serveral of his runing and easting posts in one. So I better stop here.